2013 saw two lane splitting bills in Oregon, as previously reported here. 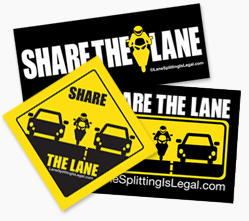 Senator Larry George, R-Sherwood District 13 introduced SB 541, which would have legalized low-speed lane splitting – limiting lane splitting to 20 MPH in cases where traffic has slowed to 10 MPH or stopped. Representatives Tim Freeman and Brian Clem introduced HB 3310 in the House of Representatives, a more restrictive bill which would have only allowed filtering in stopped traffic. The offices of Representatives Freeman and Clem did not respond to our requests for comments on their bill, but a helpful staffer in Senator George’s office confirmed that SB 541 is dead, saying SB 541 “Never got a hearing, never got anything… and so all that happened was we introduced it, it went to committee and then they never did a single thing with it.” The staffer characterized the lack of support as a “nanny state issue.” Senator Larry George is not a rider, but introduced the bill because he thinks that lane splitting “does protect motorcyclists” and “if you want do that… they should be allowed to do it.” Bravo, Senator George – we wish more of your colleagues could get on board with this concept. Unlike Oregon’s bills, Nevada’s lane splitting bill had strong grassroots support and far better luck, passing the Assembly with overwhelming support and passing the Senate Transportation Committee before being defeated on the Senate floor. Here’s hoping the supporters of lane splitting in Oregon can take a few pages from the Nevada supporters’ playbook to achieve a win next time around. Why would it be a good idea to let a person legally zoom inches between two cars so they could speed past you? The overheating thing is a load of garbage, my bike idles and there is not one out there that didn’t come off the floor without idling capabilities. I can see a small percentage of motorcyclists using this in a responsible manner but 90% just want to go fast and close to get where they are going or look cool. Try and say that is not the reason. Thanks for posting, Jody. Have you ever ridden in California and split lanes? There are a multitude of reasons why splitting is good and I’ve yet to hear a single rider say they split lanes because they want to go fast and look cool. In fact, splitting according to the CHP guidelines means that you won’t be going fast – although it’s pretty easy to look cool doing just about anything on a motorcycle. Riders are essentially immune to traffic – making splitting a vital part of commuting and other utility-oriented riding in CA. Because of this, lane splitting riders don’t contribute to traffic – good for everyone! Ever been to Europe? Lane sharing is not only legal, it is encouraged. In the UK during your riding course, the instructor/evaluator will ping you hard if you don’t filter/share appropriately. I you’re afraid to split lanes, there is nothing in any proposed law to prevent you from staying in line with the rest of traffic. Since the US is about the only industrialized country in the world without legal splitting and filtering and our morbidity and mortality record is no better than anywhere else, the argument that it is “irresponsible” or unsafe is invalid. IF all vehicles follow the rules of the road, look-signal-look THEN execute lane changes, don’t text or drive distracted, then it is perfectly safe to ride a motorcycle. Of course, many drivers fail to do the above things, which increases the danger for motorcyclists. Lane splitting does not increase the dangers from this in any way. The rider is now in more control of what happens and in less danger from behind. Does he benefit by going faster than ambient traffic? Yes! Does everyone benefit from a vehicle getting off the road sooner? Yes! Trust me, when I lane split I’d MUCH rather be going at freeway speeds. By definition, lane splitting means that I’m going much slower. By your assertion, if there were two route choices with one moving freely and one congested, a MC’ist would choose the congested route because it would be “cooler”. What a doofy suggestion! Many bikes are ” Air cooled ” if you sit trough 3 light cycles it just keeps getting hotter. has nothing to do with idling… The law is not to “Zoom” but to move. Being rear ended on a bike is a losing proposition…. Many riders still will not practice it. I was really hoping oregon would allow lane splitting. Save drive time, gas and a tone on insurance. If your scared.. Don’t! But why punish those who could benefit from it. :-/ doesn’t make sence. I don’t see why it’s a problem. Oregon lanes are wide anyway. Plus it may encourage more to ride motorcycles. They see that motorcycles are getting through traffic way faster than cars, and maybe they want to as well. Plus a motorcycle gets much better gas mileage than most cars. So if the environment is of concern, it would be helping a little bit if more people were riding to work and back instead of driving. I live in Kali and both of my bikes are air cooled. They can and will overheat in traffic if stopped. Also please remember the rider’s AC is air moving across the body. Sitting in traffic can get really hot especially when wearing protective clothing. I heard from a friend recently who works at Trimet that the drivers are being surveyed by the state on what they think about lane sharing. The traffic engineers know that with the Portland fast growing population in the last few years, traffic will eventually get even worse. So I’m haven’t lost my hopes yet about this happening here in Oregon. For the benefit of those here who made comments concerning Oregon, we are again pursuing multiple lane-sharing bills right now (2015 session in progress at the time of this post.) There is no such thing as “too much assistance” so please contact us from the BikePac link in my name here. Updated bill status and info from the link too. Thanks!